Notre Dame late the night of the fire. At this point, the spire had fallen and the roof had collapsed in on itself, landing inside the cathedral. Yesterday, perhaps the most recognizable church in the world sadly caught fire, leaving parts of the over 850-year-old cathedral in ruin. The cause of the fire remains unknown, but the French police force has already established an investigation into how the blaze began. This cathedral is one of the greatest pieces of living history the world had, bringing 13 million people through its doors per year. It held sacred religious relics and statues that provided insights on the story of Jesus Christ. Fortunately, as the building was undergoing renovations at the time, many of the precious items were removed and hence saved. Officials, however, are not saying which of the items were removed safely and which were lost in the blaze. 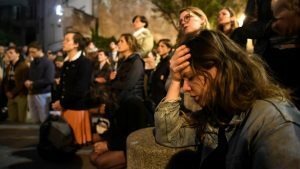 Parisians mourning and singing, watching the cathedral from a distance. Many felt the loss of the church in a very personal way, as it was truly the heart of the city, located in its center. 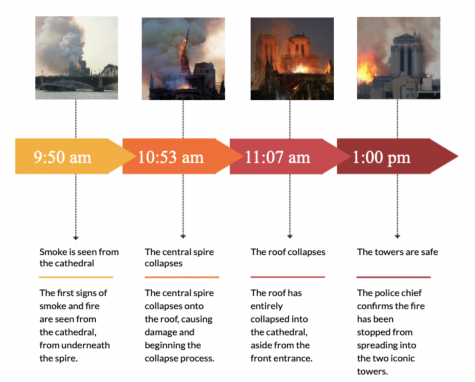 What we know as of now is that around two-thirds of the roof was destroyed, the spire in the center of the cathedral fell, and the two iconic towers at the churches front remain safe and intact. 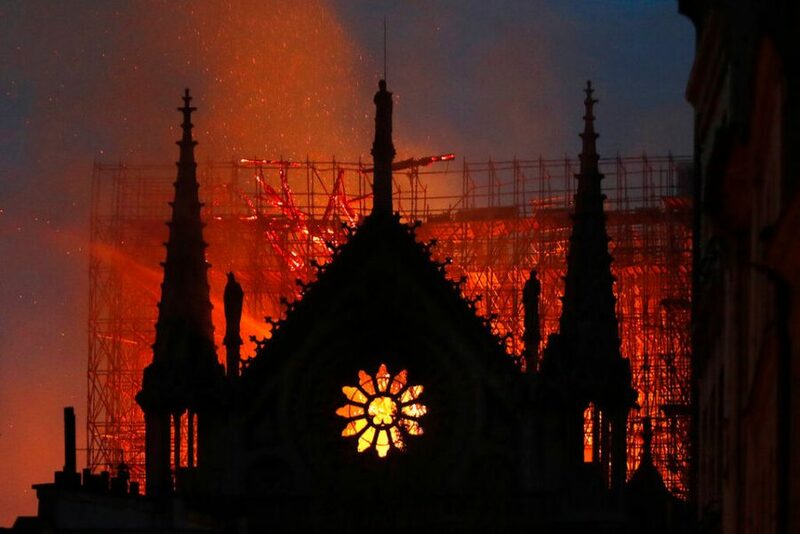 The fire began at the base of the spire, spreading outwards and upwards, engulfing the wooden 13th-century roof as well as the spire. As the world watched the fire take down parts of the monument, posts, as well as prayers, poured in. Social media websites were flooded with people sharing their memories of the place to show their support for the people of France in these tough times. The cathedral has been called “the heart and soul of Paris” by Parisian onlookers saying, “It’s very hard to watch it [burn down].” Citizens of the city even took to the streets to sing hymns and prayers while watching the fire from the plaza outside Notre Dame. French President Emmanuel Macron has already established that the people of France “will rebuild this cathedral together” and a French billionaire by the name of François-Henri Pinault has pledged 100 million euro in efforts to rebuild. The cathedral has been rebuilt in parts before and renovations take place every few years to ensure the safety of tourists, but nothing on this scale has been attempted before in modern years. With the cathedral being core to not only the city but also the people of Paris’ identity, stories of remembrance and sadness are sure to continue to pour into the papers. In spite of this tragedy, it is important to remain strong and together to support those struggling the most. Notre Dame may be in tatters, but the French people are stronger than ever. I think someone did this on purpose. But, why would someone do that? Probably someone who is against the French government or something like that. ironic that their goal was to renovate, but burned it down instead.